I arrived bright and early at the West Herts where only Don was waiting outside the door. It hadn’t got properly cold at this point, but we were certainly very grateful when the doors were opened a little early and we took our seats at our usual table with our beverages of choice to wait for the rest of our party to arrive. The build-up to the game had been dominated by Dyche’s comments about Watford to the Burnley Telegraph. His statement, “The club is a radical shift from when I was there, absolutely chalk and cheese, from a community club built on the community to now built on a model,” was somewhat baffling given that Dyche was manager during Bassini’s tenure which goes down as the most depressing period off the field that I have experienced during 40 years of being a Watford supporter. The arrival of the Pozzos not only saved the club but, during their ownership, the community feel around the club has returned with a vengeance. The comparison between now and then is certainly chalk and cheese, but not in the way that was implied. I can only conclude that Sean hasn’t been paying attention to what has been happening in Watford over the past 6 years. As we arrived in the ground, I was initially surprised to see that the Rookery concourse was heaving as it is not usually like that. Then I remembered that the club had promised everyone a free drink to toast Graham Taylor two years after his passing. It was a lovely gesture. Somehow I had managed to miss my voucher, but was quite glad to escape the crowd and take my seat. Team news was that Gracia had made three changes due to injury with Kabasele, Cleverley and Sema in for Cathcart, Doucouré and Hughes. So the starting line-up was Foster; Femenía, Kabasele, Mariappa, Holebas; Sema, Cleverley, Capoue, Pereyra; Deulofeu and Deeney. I must admit that, much as I love Kabasele, the absence of Cathcart caused me some concern. Burnley had former loanee, Cork, in their starting line-up, former management, Dyche and Woan, in their dugout and lovely Matěj Vydra on the bench. 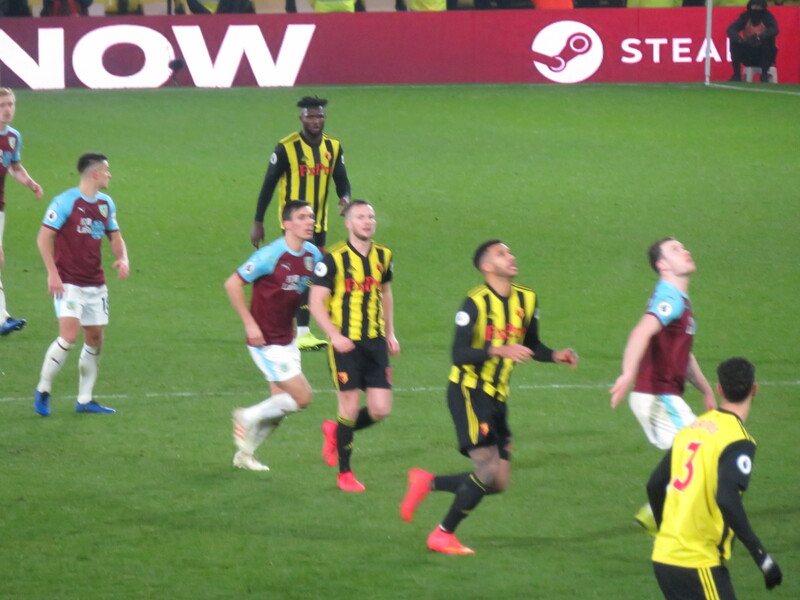 There was an early chance for the Hornets as Deulofeu went on a terrific run and found himself one on one with Heaton in the Burnley goal, but the keeper was able to keep the shot out. 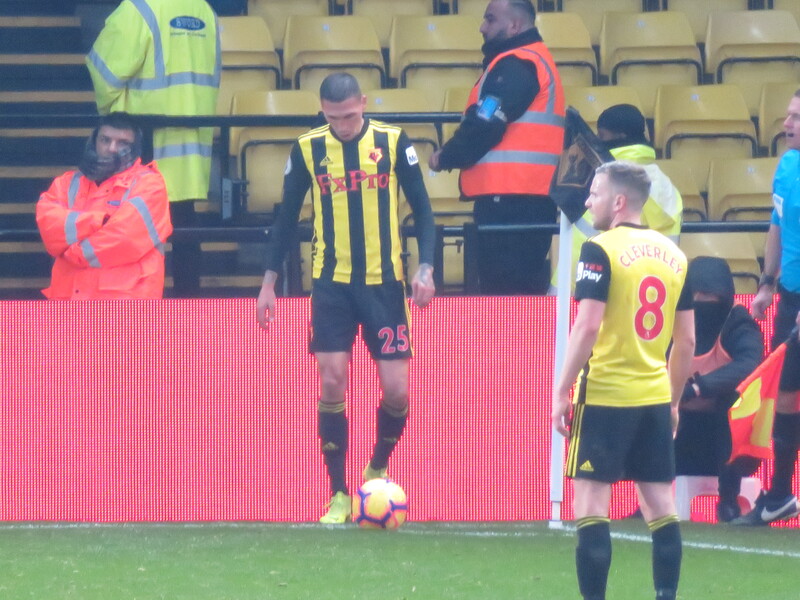 Another chance soon after as a cross from Femenía eluded Deulofeu and dropped for Pereyra whose cross was nodded down by Deeney to Sema, but the Swede couldn’t get a strong enough connection and the ball was cleared. Burnley’s first chance came on 10 minutes as a corner from McNeil was headed wide. 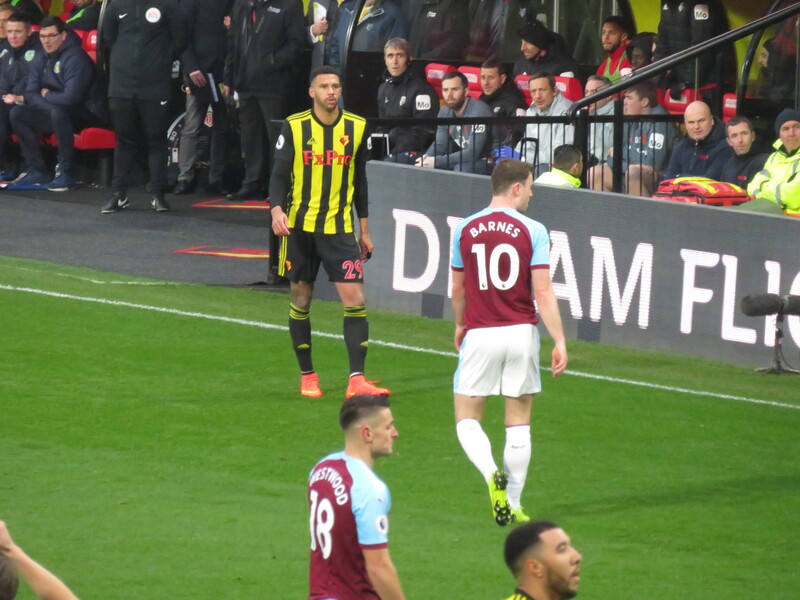 Burnley then had a period of pressure without troubling Foster, the next chance falling to the Hornets on 23 minutes as the ball reached Holebas who hit a shot from distance over the target. Just before the half hour mark, the sight of Vydra warming up provoked applause from those in the Rookery, which was acknowledged by Matěj. Foster was then called into action as a cross from Westwood was headed goalwards by Barnes but Ben stood tall and blocked the effort. Burnley got closer to opening the scoring with free kick from McNeil which hit the side netting. There was another let off for the Hornets as a defensive header from Mariappa dropped to Barnes whose shot was just wide of the target. 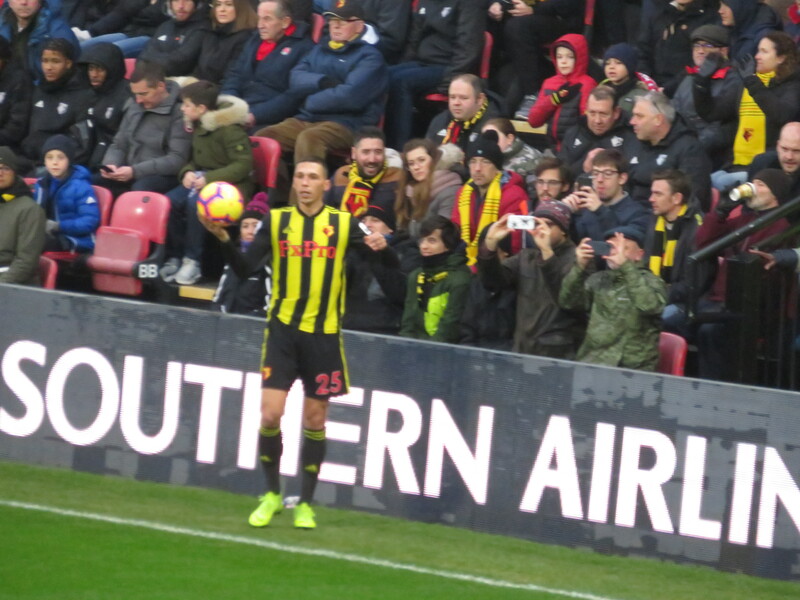 Then a rare bit of quality from the Hornets as Capoue played a through ball to Pereyra who found Deulofeu who curled a shot just wide of the far post. There was some controversy as a panicked bit of Burnley defending sent the ball back into the arms of Heaton. There were howls of “back pass” from the Rookery, but the referee wasn’t interested. Burnley threatened again through Wood but, again, the shot found the side netting. Watford could have taken the lead just before half time as a cross from Femenía found Deeney in the box, I was already on my feet as his shot flew towards the goal, but Heaton was able to make the save, so we went into half time with the game goalless. After a bright start, it had been an awful half of football. Burnley had the better of the play without causing Foster too many concerns. The visitors should have taken the lead in the first minute of the second half as a ball through a defender’s legs led to a shot from Barnes that rolled across the front of the goal with no Burnley player able to turn it in. 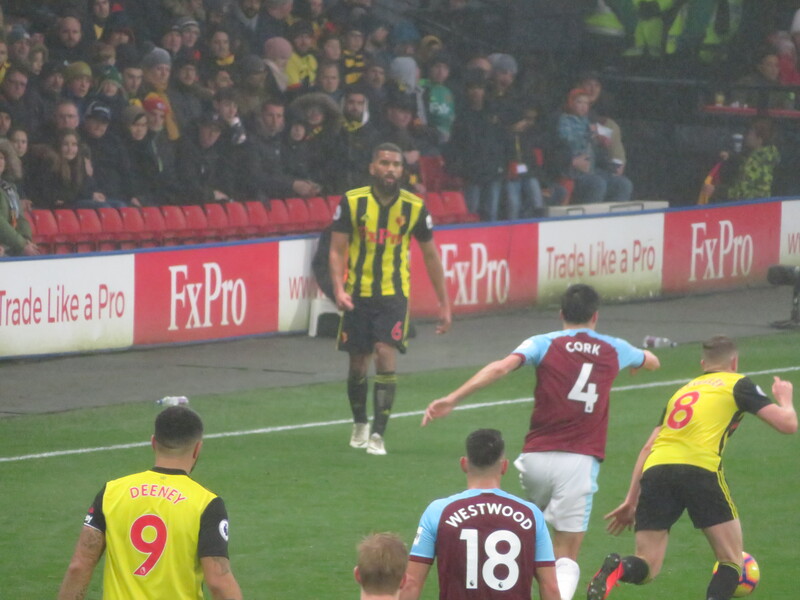 The Clarets threatened again as a cross from Wood found Hendrick in the Watford box, but Foster was off his line to make the block. Then a corner was headed back by Mee to McNeil whose shot was over the target. Watford’s first chance of the half came as Femenía crossed for Deeney whose shot was blocked. The first substitution of the game was made on 56 minutes as Sema, who had been struggling playing out of position on the right, was replaced by Success. The substitute’s first action was to find Pereyra in a dangerous position, but the shot was high and wide. Soon after, Success was flattened by Mee, who was booked for his trouble. The Hornets were doing much better at this stage and Cleverley tried a shot from just outside the area, but it was an easy save for Heaton. On the 72nd minute, GT’s picture appeared on the big screen and the crowd rose to cheer him. I couldn’t quite decide whether I should be applauding or raising my scarf, so I tried to do both by applauding with the scarf draped over my arms. I probably looked very strange, but it made me feel as though I was doing my part. Gracia was then forced into a second substitution as Femenía left the field with an injury and was replaced by Britos. There followed a booking for each side. First a silly yellow for a display of petulance by Deulofeu when a throw was given to the opposition (choose your battles, Gerard). Then Bardsley was booked for a foul on Success. There was a major let off for the Hornets in time added on as, with the Rookery screaming for a foul in the build-up, McNeil’s shot was parried by Foster and fell to Barnes who found the net but was denied by the linesman’s flag. I haven’t seen the incident again, but it seems that we were a bit fortunate with the decision. The final whistle went to a half-hearted chorus of boos in the Rookery. It was a terrible game of football, but I still don’t understand the need to boo your own team. As so often this season, we cannot play against teams set up to defend. Burnley are masters of this art, but it is horrible to watch. They also have a nasty habit of backing into defenders trying to get to high balls. A dangerous tactic that won them numerous undeserved free kicks. I also couldn’t help feeling sorry for the fourth official who must have been driven to despair by the constant moaning from Dyche and Woan. To be honest, this is not a new tactic from Dyche, he honed his skills complaining to the officials from the touchline when he was in charge of our reserves (when such a team existed). But enough about the opposition. We missed Cathcart and Doucouré, so I was pleased to hear that their absence was due to minor injuries. The absence of Doucouré seems to have an adverse effect on Capoue, who has more to think about and less freedom. There is also less creativity going forward which may have played a part in Deulofeu and Pereyra having off days, although each had shots that were not that far off. If one of those had gone in, it would have been a very different story. On the way back to the West Herts I was told of a chap in the Rookery who declared that he had been watching Watford for 61 years and that this afternoon had felt as though it lasted all of those 61 years. Still, looking at the positives, we don’t have to face Burnley again this season and are still 7th in the table. So to St James’ Park next week for another crack at Newcastle. I suspect that the crowd will be much depleted, but I hope that the lads give those who do travel something to cheer. We owe Newcastle a beating, let us hope that it comes next week as a cup run would be rather good fun. This entry was posted in Watford FC and tagged Adrian Mariappa, Ashley Barnes, Ashley Westwood, Ben Foster, Ben Mee, Burnley FC, Charlie Taylor, Chris Wood, Christian Kabasele, Dwight McNeil, Etienne Capoue, Gerard Deulofeu, Isaac Success, Jack Cork, James Tarkowski, Javi Gracia, Jeff Hendrick, Jose Holebas, Ken Sema, Kiko Femenia, Miguel Britos, Phil Bardsley, Roberto Pereyra, Sean Dyche, Tom Cleverley, Tom Heaton, Troy Deeney, Watford FC on January 20, 2019 by franelynn. Lovely piece as usual – I always enjoy your build up to the game stories. Anyway, specific reason for commenting is that backing in thing that you mentioned. I made a strong point about this on the Watford Mailing List yesterday because there will be a major/tragic injury at some point. The referees need to rule the other way in obvious instances like this. Red cards and/or sin bins always apply for unbalancing a jumping player in rugby by going under his centre of gravity. Thanks again for bring a great day and a poor match to life. A.